Contents of a bin or bins hired from Quick Skips SA remains the property of the hirer until such time as the hirer pays Quick Skips SA the full hire charge, if after a reasonable time the hirer has not paid Quick Skips SA the full hire charge then the hirer agrees that Quick Skips SA may deposit a similar amount of material to that collected from the hirer at the hirer’s site, office or place of residence without further notice. This agreement is a legally binding contract and shall extend for a minimum period of one (1) year from the beginning of service, and shall be automatically renewed from year to year unless either party shall give written notice of termination to the other at least thirty (30) days prior to the annual termination date. This schedule of Charges during any renewal period shall be adjusted to reflect increases or decreases in the Consumer Price Index during the preceding twelve month period. In addition, the monthly charge may readjusted by the Contractor from time to time upon 30 days notice subject to the approval of Customer prior to the effective date of the adjustment. Contractor agrees that if Customer no longer requires any collection and disposal service for its waste materials, through discontinuance of its business, relocation outside the area in which Contractor provides collection service or similar reason. Customer may terminate this agreement upon written notice given to Contractor at least thirty (30) days prior to the intended termination date, but only upon payment of all amounts then due to the Contractor. 1. The equipment provided by the contractor is for the storage and collection of non-hazardous waste materials. 2. Customer shall be responsible for the cleanliness and safekeeping of the equipment. 3. Customer shall not make any alterations or improvements to the equipment without the prior written consent of the contractor. 4. Customer shall not overload the equipment, nor use it for incineration purposes, and shall be liable to contractor for loss or damage in excess of reasonable wear and tear. 5. Customer warrants that waste delivered to contractor hereunder will not contain any hazardous or toxic waste as defined by applicable laws or regulations of the Commonwealth and States and Territories of Australia and that no free flowing liquids or viscous materials shall be deposited by the customer into the equipment. 6. No mechanical means will be used to compact the contents being placed in the equipment unless the equipment is supplied for the purpose by the contractor. 7. All equipment furnished by the contractor for the use by the customer which the customer has not purchased, shall remain the property of the contractor and the customer shall have no right, title or interest in the equipment. 8. The customer will compensate the contractor for any loss or damage caused to the contractor’s equipment at current market value of contractor’s equipment, valued at the time of the reporting of the loss or damage. This does not apply to damaged equipment performed by the contractor’s employees. 9. The customer agrees to defend, hold harmless and indemnify the contractor against all claims, lawsuits and any other liability or injury to persons or damage to property or the environment connected with or relating to the use of the equipment by the customer or breach any warranty by the customer or the use or the means of other routes by contractor as referred to in clause 16. 10. On collection day, the contractor’s vehicle shall have access to the equipment. If the equipment is blocked to prohibit collection, customer will be notified and an additional attempt for collection shall be made by Contractor’s vehicle. Any further attempts made for collection will be classified “extra service” and so duly charged. 11. Customer shall pay the contractor for the collection, disposal and equipment lease rental provided by the contractor (including all charges for equipment maintenance) in accordance with the charges. 12. Payment shall be made by Customer to the Contractor ten (10) days after the date of and invoice from the contractor and time shall be of the essence. In the event that any payment is not made when due the Contractor at its sole option may at any time terminate this agreement on given notice in writing to the customer and recover the equipment from the premises of the customer. 13. Contractor may at any time by notice to the customer vary the rates used to calculate the charge. 14. The Contractor and the customer agree that where the equipment is provided by the contractor, the charge has been calculated by reference to two several and independent components, namely a charge for the lease rental and charge for rendering to the service. The Contractor will be entitled to charge for the lease rental of the equipment in accordance with the charges shown elsewhere although it is unable to render the service. 15. Changes in frequency of collection service, number, capacity and type of equipment shall be agreed to in writing by the parties. 16. Customer warrants that any access provided by customer from customer’s equipment location to the most convenient public way is sufficient to bear the weight of all of the contractor’s equipment and the vehicle reasonably required to perform the service. Contractor shall not be responsible for damage to any private pavement or accompanying sup-surface of any access or other route reasonably necessary to perform the service. 17. If any conflicts of differences exist in this agreement between terms which are printed and those which are typed or written, the typed or written language shall govern. 18. All notices shall be sent by either party to the address indicated on the face thereof by ordinary mail and shall be deemed to have been duly delivered 2 days from the date of posting. 19. Nothing in this agreement is in derogation of any rights as a consumer may have under the Trade Practices Act 1974 and other State and Territory Laws. 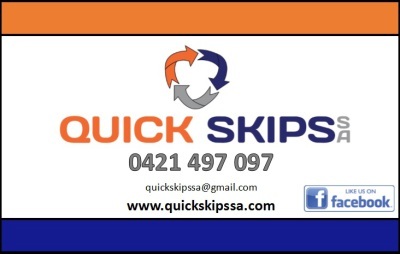 Quick Skips SA have a 100% refund policy in the event of non-delivery of a skip, or if a skip does not arrive on the scheduled date. You may also receive a refund if you cancel your order by calling or emailing Quick Skips SA not less than 24 hours prior to 7.30am on the scheduled delivery date. Any time outside of this period, Quick Skips SA reserve the right to charge the full amount of the skip hire. 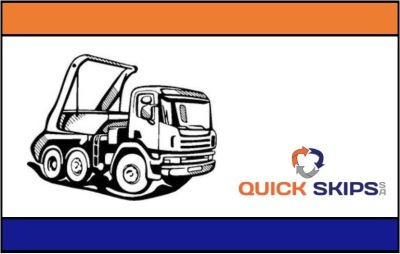 Disposal charges are for the disposal of the waste collected from your site in the skip. Commonly this is comprised only of a “tip fee”, but in some cases where waste needs special treatment there are treatment charges included in the disposal charge. Quick Skips SA will refund disposal charges only if it can be shown that an error has been made in the calculation of such charges. Thank you for your order, our standard hire is 5 days. Please contact us within 24 hours of collection should you wish to extend your skip bin hire period.